If you like your brownies chewy, then this is the recipe for you. Position an oven rack on the middle rung. Heat the oven to 350°F. Butter an 8-inch square pan, line the pan bottom with parchment (or waxed paper), and then butter the parchment. In a double boiler over simmering water, melt the butter and chocolate. Remove the pan from the heat; cool slightly. Stir in the sugar, salt, and vanilla. Mix in the eggs, one at a time, stirring each time until blended. Add the flour and cocoa; beat until incorporated and the mixture is smooth, 30 to 60 seconds. Scrape the batter into the prepared pan and bake until the top is uniformly colored with no indentation and a toothpick inserted in the middle comes out almost clean, with a few moist crumbs clinging to it, 35 to 45 minutes. Set the pan on a rack until cool enough to handle. Run a paring knife around the inside edge of the pan and then invert the pan onto a flat surface and peel off the parchment. Flip the baked brownie back onto the rack to cool completely. Cut into squares with a sharp knife. 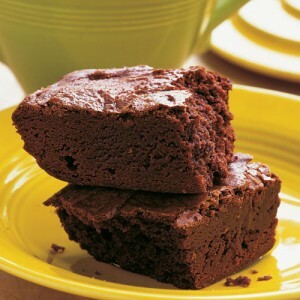 Added flour helps to give these brownies their chewiness. It's important not to overbake these or they'll dry out. This recipe can be doubled easily; use a 13x9-inch pan and increase the baking time slightly.